We expected day 4 of our trip to be a fairly standard one of quiet time, bus activities, karaoke (a 2019 Pilgrimage favourite!) a lunch stop and, eventually, arrival at our evening destination. But our lunch stop turned out to be far from ordinary! Boyden, one of our Pilgrims from Geraldton, has family in Warakurna and had organised for some of them to drop in and see him when we stopped there for lunch. Little did we know that his grandfather was a Police Officer in charge of the Warakurna Police Station – the first fully Aboriginal-run station in Australia! – who spoke to the local school principal and invited our mob to pay them a visit. 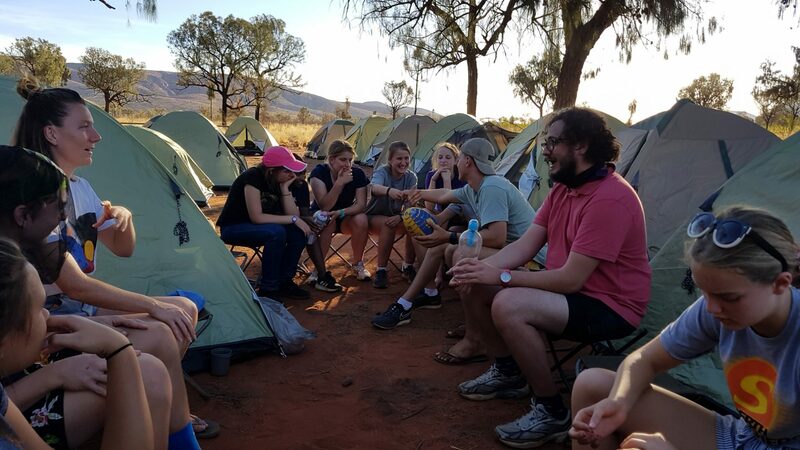 Many of the students in Warakurna haven’t spent much time outside of the community or ever seen a city or the ocean, so our big coach was quite a novelty and eager students raced out to see us, waving and shouting an enthusiastic ‘Hello!’. We spent about half an hour chatting with kids and staff and playing games and were so honoured by the invitation and another beautiful, warm community welcome. After that it was across the border and into a bush stop (yep, that means no power, water or toilets!) 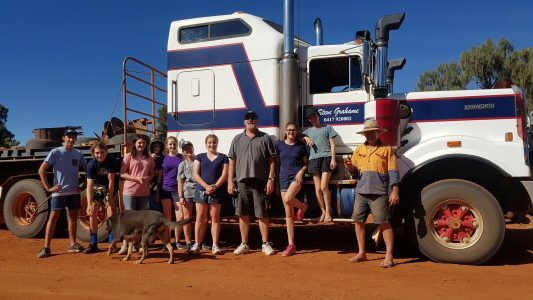 just outside Docker River community where we ran into Steve from Outback Truckers and found some pretty large evidence of camels and horses, which had to be removed with shovels and enthusiasm before we could set up camp. We rested, walked in the bush, ate (lots) and enjoyed a glorious fire under a blanket of innumerable stars before heading to bed in anticipation of a BIG day tomorrow.